Do you want the good news or the bad news about revision? Everyone always goes for the bad news first, don’t they? OK, here goes. There are no shortcuts to exam revision. Well, none that work, anyway. Sure, you might feel productive while you’re merrily highlighting class notes or surfing your way around Wikipedia. But how much learning are you actually doing? Chin up, though; it’s time for the good news. Learning how to study effectively is easy; you just need a plan and you need to stick to it. And here’s the handy thing. By following a set plan, that hard work suddenly stops being such a grind. Get into good study habits and you’ll barely notice you’re revising. Sound good? In our step by step blog guide we’ll help you sharpen your study skills. We’ll show you how to get more organised, how to study for exams and how to ensure it all comes flooding back in the exam hall. It’s our revision masterplan. Let’s get going. When you’re studying you’re going to need a quiet space. For many people, this will be your bedroom, but you might find it’s good to work in the local library or in the study space at your school or college. You don’t need to study in the same place every time – moving about will help keep your mind fresh. But wherever you end up, make sure it’s tidy and comfy with lots of natural light. Most importantly, make sure there are no distractions. No TV rabbiting away in the corner, no mobile phone bleating out Facebook notifications, no temptations to veer away from the task at hand. Keep a bottle of water and some healthy snacks close by as well – fruit, nuts and the like will help fuel you through your study sessions. 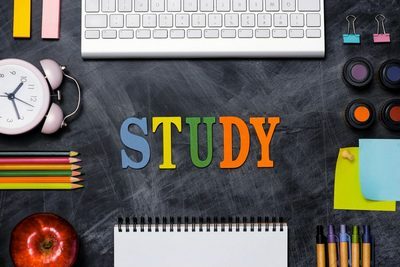 Through the next few weeks Oxford Learning College will be running a series on revision hints and tips to help all students get the best grades possible. Follow us on Facebook or Twitter to get alerts on when they are available.